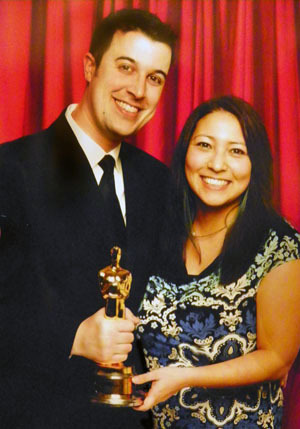 Aaron and i went to the Eastman House Oscars Party. It's fun to see everyone dressed up. Even the servers dress up. 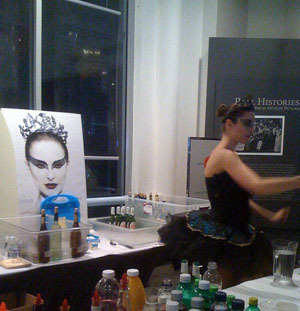 The bar tenders were Black Swan ballerinas. Each of the food tables was a theme for a nominated movie. Like True Grit pulled pork and baked beans. I couldn't figure out why the coffee table was The King's Speech though. 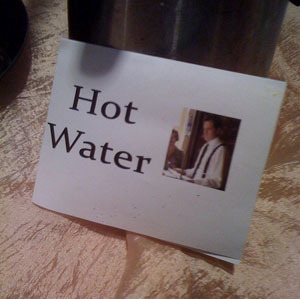 Each pot had a picture of Colin Firth on it. Hmmmm. We had to pose with Oscar too... not our Oscar. The other Oscar. If it had been a tea table, I could have seen a tenuous British movie/tea connection, but not sure about coffee. Maybe because the coffee is hot and so is Colin Firth?? maybe because in the movie he was "in hot water"...taking on the role of king and having an issue with stuttering?